I hope your week started good. I can't believe that next week is already Christmas. I still have so much holiday make-up to show you but I hope that these are good until New Year's Eve since there is so much glow which comes with them. Let me start with Guerlain Météorites Flacons Enchants. This is one of the most gorgeous versions of brand's much anticipated Météorites, also known as balls *grins*. I believe most of us didn't even bother to know how it performs, we were all starry eyes looking at it and saying "that package though!". The top of the lid is a see through multi dimensional gold in white scene with Guerlain logo. The only improvement I could think of would be to put these Meteorites in a snow globe and let the balls snow or something, which is probably not all that practical but hey, just fantasizing. As the name suggests non-sphere balls are thought to be snow flakes. The matching white puff with golden ribbon is also killing it. It all smells heavenly and I love the fact that these come in a sturdy plastic packaging rather than cardboard. Even if you do the impossible and finish the powder, you are certain to keep the box. Its full name gives us clue about how it meant to be used. Guerlain Météorites Flacons Enchants, Light Enhancing Powder Face & Décolleté. 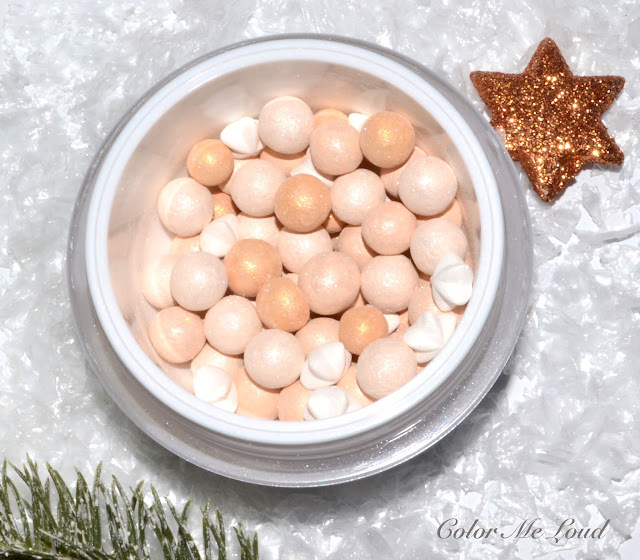 This time of the year when you are partying with your décolleté exposed, you are supposed to sweep these balls a little on them *cough cough* and to bring the light in a subtle way. I used these on my face with a soft face brush and gently dusted it all over. It looked fine and not too shimmery but my dry complexion eats up shimmer so I can't talk for all. Hardly anything looks shimmery on me, including frosty highlighters. About the mattifying quality, it is hard for me to test it since I rarely get shiny during winter days. Guerlain is known for their mattfying powders so I don't think this one would fail. The powder is talc based, which is great for oil absorption but if that breaks you out, you may not want to invest. Because of the super luxurious packaging this one costs and an arm and a leg (around 130 €) but it is definitely a collector's item which can be worn on a daily basis. On a bright note, the lace design doesn't get washed away by the first use but it nicely persists over several uses. I used it for a week straight and one side is still intact. 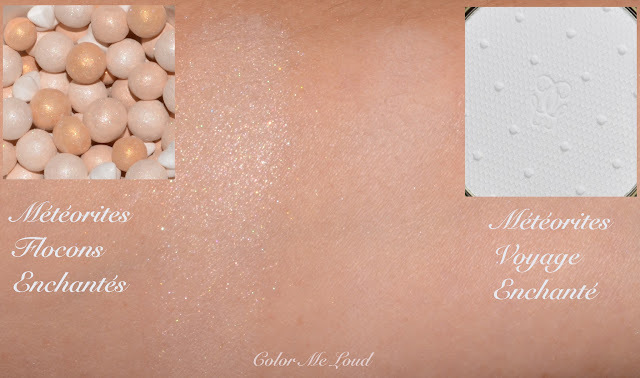 Here is a super heavy swatch of both of the powders for you to see the difference. You can see that the glow is obvious in Flacons Enchantés whereas the lighter shade of Voyage Enchanté illuminates in a subtle way. Although Voyage Enchanté works lovely with my skin tone, I wouldn't recommend it from NC40 upwards as it might turn ashy. If you wouldn't like a touch of white lightness but prefer more of the skin-perfecting properties, I would suggest you to wait for the upcoming Spring. I got to test the powder and it is so gorgeous! It will also cost an arm and a leg but hey, you have two of each right? Then save the other two for spring. *whispers* The compact of the Spring one is to die for. Final thoughts: Without a doubt this one was the most gorgeously packaged collection of the season, even for the year and maybe since last five years? Loving both of the powders. If you would like some glow, you might want to chase Guerlain Météorites Flacons Enchantés. 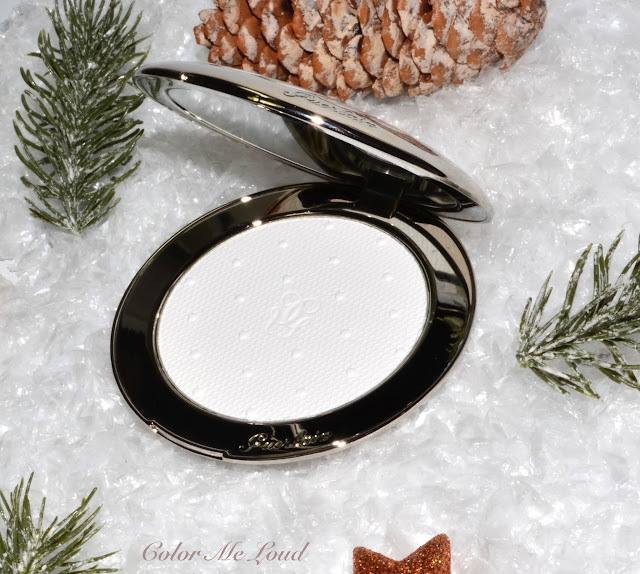 If you were searching for a mattifying powder in a collector's packaging, then make Voyage Enchanté yours. If you are just after the compact for the skin-perfecting/blurring effect, wait until mid-January. Spring collection is on the corner and it will be so gorgeous too. 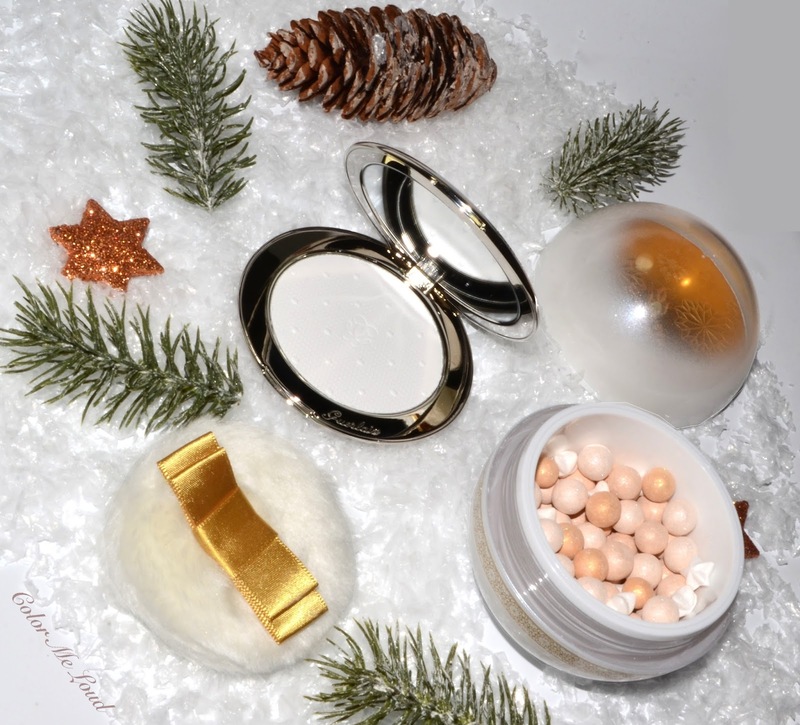 Have you picked one of these powders? Or maybe both? What do you think of luxurious packaging? Would you rather tend towards plastic packaging and less expensive products or do you appreciate that not all the packaging turned plastic over the years? Disclaimer: Météorites Voyage Enchanté was provided free of charge for my consideration. Meteorites Flacons Enchantés was purchased by me. I am not paid for this review. All opinions are honest and my own. so beautiful! can't wait to see what spring brings!!! did you continue to test the Sisley powder? any new thoughts about it? i have had good luck with Sisley powders and need a first rate powder to set my makeup! thanks as always for your informative posts! i want cosmetics that make white cats too!! This looks beautiful, but I'm not really a collector and I hardly ever wear powders.I got the Chanel camellias powder of 2014 and have barely touched it, so ... For me, the BB bricks and some of the Edward Bess blush palettes work better for overall brightening effects. Oh this Collection was by far the best in terms of packaging!! I got the balls (cough cough) ( I laughed so much with your description of sweeping the balls to décolleté hahahahha ) but I skipped the mattefying illuminating powder when I saw the upcoming Spring one so I prefer to invest in that one! I'm also afraid of extra white powders on my skin since I'm so white that I will turn myself to a high end made up ghost ! I think this was my favourite holiday collection this year; everything was so beautiful. I bought the "balls" (hee! ), the polish and the lipstick, which was no small feat, let me tell you. Everything sold out instantaneously at counters and we don't have as many online options in Canada as they do in the US. My local Guerlain counter was sent ONE bottle of the nail polish, which the lovely SA kept aside for me. Hi Sara, hahahaa.... i have 2 arms and legs, but i'd like to save them for a rainy day you know? And as for balls on my chest... erhmm.... maybe not these tiny ballz! Honestly, I didn't think this year's meteorites worked all that great, but definitely one for the museum!